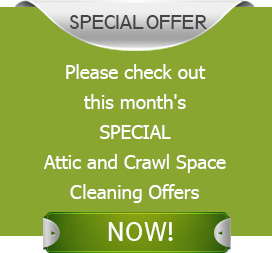 Your attic and crawl space are a part of your home you wouldn’t want to neglect! Far from ignoring these functional areas, you need to pay special attention to them. Turns out, a lot of potential hazards that can impact the entire property take root in these dark and dingy places. Proper maintenance and regular monitoring of the attic and crawl space is vital for stemming the existing problems and keeping the property clean, hygienic and energy efficient. Quartz Solutions is the perfect choice for this. We are a team of experienced technicians, with the prowess and technical know-how to provide the best solutions for any kind of attic and crawl space related issues. 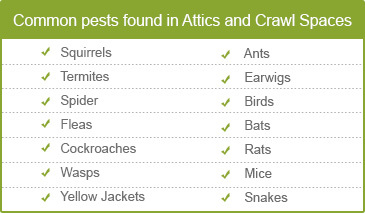 It pays to be vigilant when it comes to your attic and crawl spaces. Else, the dangers that may be developing will only spiral out of control and turn into a costly proposition for homeowners in the long run. Animals like squirrels, rats, bats, house mice find dark and dingy places a hospitable environment. They cause a lot of destruction to property by chewing on electrical wires, insulation, ducts and air vents. Moreover, their urine and poop leaves a stinky mess that can spread germs. Dripping ducts and shredded insulation can impact the home’s heating and cooling, ventilation, and other equipment. This can cause a spike in the utility bills. Crawling insects carry germs which can spread infections and trigger dangerous diseases. Wet and humid environment promotes the growth of mold colonies, mildew, and fungus. Moist conditions are known to cause wood decay, contaminate indoor air and disintegrate structural integrity. To start with, a thorough inspection by professionals is essential because it provides visual clues to the extent of the damage. Quartz Solutions has a team of experts with the ability to handle it efficiently. Our crew will drop in at your premises for a scheduled inspection of the attic and crawl space. They will scan the area meticulously for unwanted intrusions, “gremlins”, damaged insulation, faulty ventilation, mold colonies and more. Having evaluated the situation, they will formulate a remediation plan at the most competitive rate. We, at Quartz Solutions, understand the value of hard-earned money, hence our attic and crawl space cleaning strategies are affordable with no hidden costs. Cranford, the 4-square mile township in Union County, NJ that is home to 22,578 is quiet, close-knit and safe neighborhood. With great civic and recreational facilities, as well as easy access to New York City, it is the perfect place to raise a family. Cranford is trying to balance the charm of yesteryear with a progressive future. We, at Quartz Solutions, want to be part of the beautification process. Let us help keep your attic and crawl spaces in A-one. Contact Quartz Solutions at 973-536-1013 today and avail our complimentary inspection offer! Wasn’t sure about which insulation would work best. Josh’s guidance definitely helped streamline the process. Thanks for the good work!